In this week’s pack we’ll be offering delicata squash; broccoli or cauliflower; salad mix; fruit (we’re not sure which fruit yet); onions; garlic; potatoes; tomatoes; sweet peppers; celery; kale; herbs; and eggs. We are planning to continue the packs until the week of November 21st. Afterwards, if we still have a nice selection of produce, we could continue distributing packs if there is enough interest. We are thinking of just doing a Thursday pack to Victoria Park. If this sounds like something you would like, or you have questions, please get in touch with us so we can plan ahead. Now that the cover crops are established and growing nicely, the next big job is to move the hoop houses on to the fall greens and carrots. This last week the cattle got out of their paddock three times (!) so we moved them to a nice juicy pasture with lots of clover. Our hen with three chicks has moved into the chick fortress in the front yard. 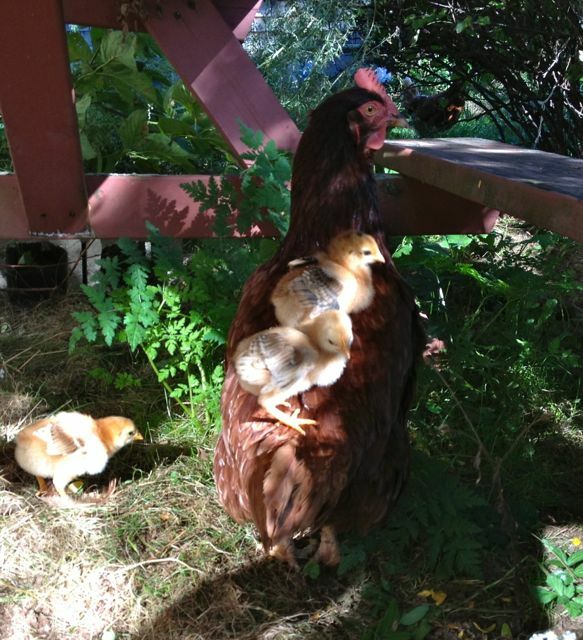 On Friday the chicks tried a new game called Slide Down Mom. She tolerated it pretty well. What’s a single mom to do? The chicks were having a blast! We will see you all soon!